Jadeveon Clowney is already an early favorite to be the number 1 pick overall in the 2014 NFL draft and can be found on every defensive award watch list heading in to the 2013-2014 college football season. As the Gamecocks get set to take the field to face the Tar Heels of North Carolina, all eyes will be on #7 to see if he can start where he left off, nearly decapitating Michigan running back Vincent Smith during the final game of the 2012-2013 season. We have all seen “The Hit” a million times and should continue to see it for years to come. This particular play during the Outback Bowl catapulted Jadeveon Clowney into the national spotlight, giving analysts and Gamecock fans plenty to talk about during the off-season It was also a great launching pad for what is needed to be in a heated race of a Heisman hopeful; “Heisman Hype” so to speak. 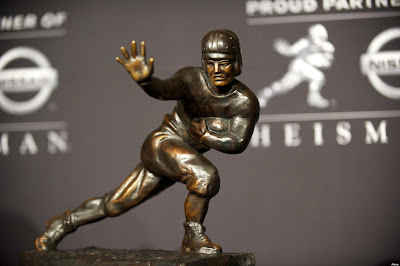 As we all know too well there has never been a pure defensive player to win the most prestigious award in college football, but if any one player is capable it is Jadeveon Clowney. Clowney finished sixth in Heisman voting last year while compiling 54 tackles, 23.5 TFL and 13 sacks. He was also credited with 2 pass breakups and 3 forced fumbles and had even more of an impact from a non-statistical standpoint. In order to gain more votes on this seasons ballot, Clowney will obviously have to maintain his statistics from a year ago as well as improve them. For Clowney to be in position to win the Heisman as a pure defensive player he will likely need to almost double his sack total and create more turnovers for his South Carolina defense. In 2002 Terrell Suggs recorded 24 sacks, which is the record for most sacks in a season at the FBS level while playing for Arizona State. With a possible 13 or 14 game season, logging 24 sacks is not out of the question; Difficult, yes but certainly obtainable. In recent years there have been a few pure defensive players to make the trip to the “Big Apple” only to fall short of glory. As recent as last season Manti Te’o finished 2nd in Heisman voting as Johnny Manziel took home the hardware. With Te’o finishing right behind Manziel there is a shimmer of hope that one day it can and will be done. In 2009 Ndamukong Sue finished 4th in voting after posting some pretty gaudy numbers. Sue recorded 85 tackles, 12 sacks, 24 TFL, 10 pass breakups, 3 blocked kicks and 1 INT during his senior season as a Corn Husker. I can remember analysts stating after Sue’s stellar campaign that if he couldn't win it no one could. Of course that was before the football world was fully aware of Jadeveon Clowney. Of course, like always there is an “easier” way out. Let’s just say Clowney matches his production from a year ago while slightly improving them and gains a few more turnovers to his credit, but also has 6 or so offensive TD’s this season? That could lead to a Heisman recipe and could essentially blow away his Heisman competition. You also risk injury to the best player on the field by doing this, which is purely selfish from a team standpoint. Wins and losses are not gained by individual performances. Football is the ultimate team sport and no player should sacrifice his team for an individual goal or accomplishment. So, can Clowney win the most sought after college football award? Absolutely! Can he be the first pure defensive player to do so? Of course! Our job as fans now will be to support Jadeveon and the team to win games and the rest will take care of its self.